With building prices skyrocketing in and around Atlanta, many small business owners seek out older buildings or even older homes from which to run their business. This is often a great way to limit congestion in travel, while also giving your patrons private parking spaces and a more personalized setting. Yes, the idea of running your own business out of a small building may seem ideal, but it is incredibly important that you take all aspects of building ownership into consideration before opening a business from an older home or office building. Making sure your clients and customers are safe is your first order of business when it comes to running a business out of a small building. It is important to create an atmosphere that is welcoming as soon as your customers walk through the door. If you have windows or doors that jam, buckling floors, a leaning chimney, or cracks in your walls or ceilings, your customers may get an uncomfortable feeling about putting their trust in your business services. At Anglin’s Foundation & Masonry Repairs, we are your trusted sources for ensuring that your small office space is safe and secure for your business and your customers. 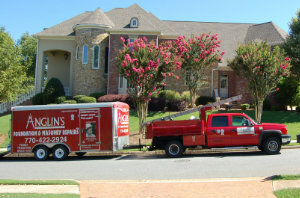 We specialize in building repairs, and we have been providing exceptional services for over 80 years right here in Atlanta, Georgia. We are familiar with the limitations and complications of Georgia red clay, as well as our hard-to-predict winter weather forecasts. While small, older homes can often be purchased at a very reasonable rate, these homes often have an unstable foundation that comes with them. Cracks in the walls, cracks in the slab foundations, sinking crawl spaces, and cracks in the bricks are all signs of foundational issues that should never be ignored. If you are thinking of purchasing, or have already purchased an older building that needs repairs, contact Anglin’s Foundation & Masonry Repairs today. We will address your structural foundation problems in a timely manner in order to create a safe working environment for your employees and your customers.